The Prima is graceful and strong. Contoured to fit the natural curves of the body making it very easy to carry the table on outcalls. The Prima is a very good choice for a lightweight table. Hourglass tapered shape, 30" wide at the shoulder area and 26" wide at the waist area. Mid-brace Cradle-lock Cabling System with 1,000 lbs test cables. 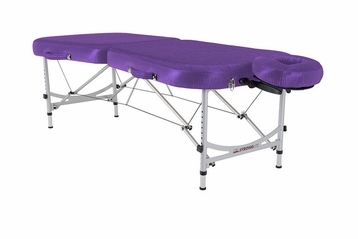 Don't forget to check out other supplies to go with your Stronglite Prima such as Massage Table Sheets, Bolsters, or Table Cart!